I’ve made choux pastry many times before, but always baked it to make cream puffs or eclairs. I’d heard, though, that you can also deep-fry it, and I thought that this could be a way to achieve the golden-brown outside and hollow inside described in the book. Happily, choux pastry is also made with beaten eggs and white flour, so it fits in with the text. 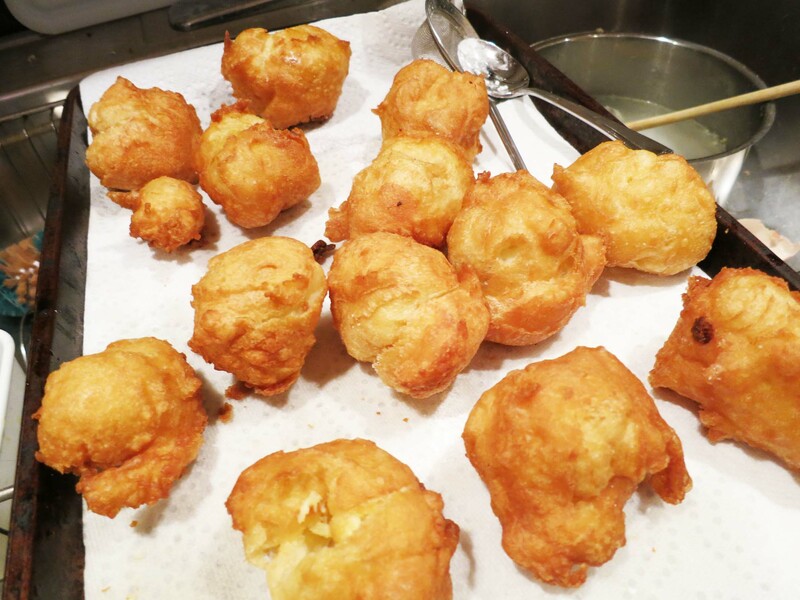 (I’d considered using a beignet recipe, but those involve yeast and there’s no mention of that in the book) However, I did make one change to the standard choux recipe– I substituted in egg whites for half of the eggs (by volume). I figured that since Alton Brown uses two extra egg whites to get a crisper puff, using more extra egg whites would help even more. 2. Bring water, butter, sugar, and salt to a boil in a pot. 3. Remove from heat, and dump in all of the flour at once. Stir with a wooden spoon until the mixture forms a dough. 4. Return to heat, and continue to work the dough with your spoon until you see a film of cooked dough on the sides and bottom of the pot. You’re trying to cook out some of the water to make more room for eggs. 5. 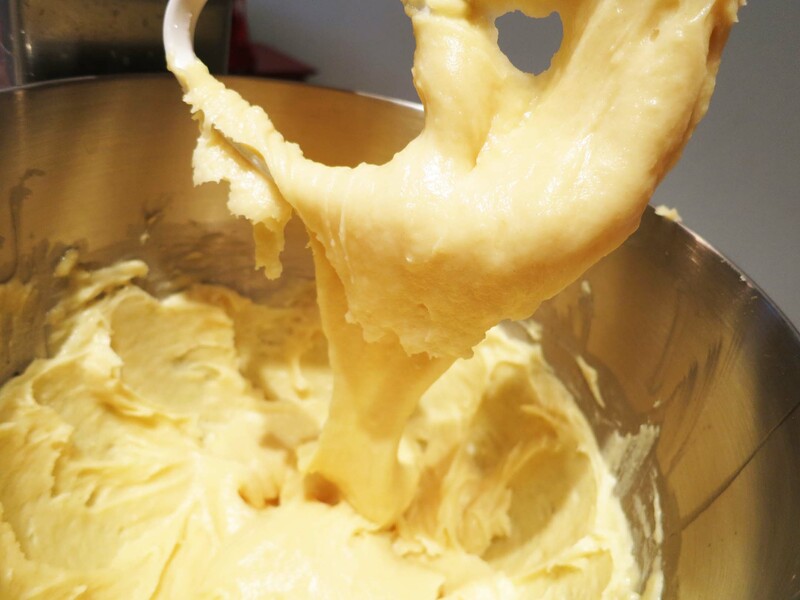 Transfer the dough to the bowl of a stand mixer and let it cool for 2-3 minutes. 6. 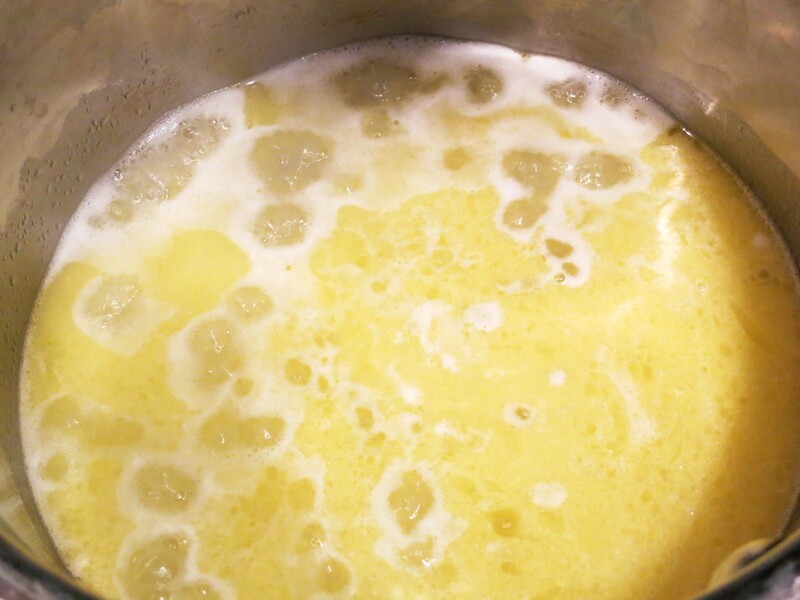 Add the eggs, one egg (or one blob’s worth) at a time, mixing on the lowest speed until each egg is incorporated before adding the next. Once the mixture forms a smooth, shiny dough, stop– even if you have some egg left over. It should not be runny– when you pull your beater out of the mix, it should make a triangle-shaped point, rather than breaking off in a ragged edge. 7. Using two spoons (or a spring-loaded cookie scoop), drop ping-pong ball sized balls of batter into the hot oil. If you’re using a small fryer like mine, only do two balls at a time, or you’ll cool the oil down too much. 8. When the bottoms of the balls turn golden-brown, flip them over and continue frying until brown on all sides. Note that even after they’re pale golden, these will continue to cook and expand, cracking open to reveal more surface area, which will then turn golden. Below you can see the smaller, partially cooked balls, and the expansion that happened after a few minutes. I fried these for 4-5 minutes to make sure they were done expanding. Remove to a paper-towel lined tray and let cool slightly. I dust these with powdered sugar, since I like my fried foods slightly sweet. I guess traditionally you wouldn’t do this, but hey, this is my recipe! How did they turn out? Well, they were golden-brown, puffy, and mostly hollow on the inside. The outsides were crisp and did melt on the tongue, but the inside was still soft and a bit eggy, not at all as I’d imagined. I shouldn’t be surprised– how could something with multiple eggs in it turn out thin and crispy? And honestly, they’re kind of greasy– probably a consequence of needing to cook them for so long to get that nice brown outside. But when I used smaller scoops of dough they didn’t get as nicely hollow inside, and taking them out sooner just resulted in a slightly flabby, pale puff, so I’m not sure how to combat the grease. Perhaps using a melted solid fat (like shortening or lard) would have worked better, since it wouldn’t have that oily mouthfeel. In the end, these turned out tasting like unfilled cream puffs, only oilier. I much prefer the baked version, and I wonder if I could get a nice, crispy shell by using this egg white ratio in a baked puff. I’ll definitely look into using more egg whites for my future cream puff endeavors, but for now it seems that Ma Ingalls’s Vanity Cakes are beyond my reach. Readers, any thoughts as to how to achieve that perfect, golden, shatteringly crisp bubble of pastry? *Note: also, these do NOT keep well. I fried them up one evening and by the next morning they had shrunk down to about 2/3 of their original size, and the greasiness was even more pronounced. So “putting the cakes in the cupboard” for a party would not have worked at all. You could try and fry them “Churros” style, i.e. pipe long strips of the dough. They usually get very crispy, though not “bubbly”. If I were making these again I’d definitely use melted shortening instead of vegetable oil. Good luck if you ever give it a shot! 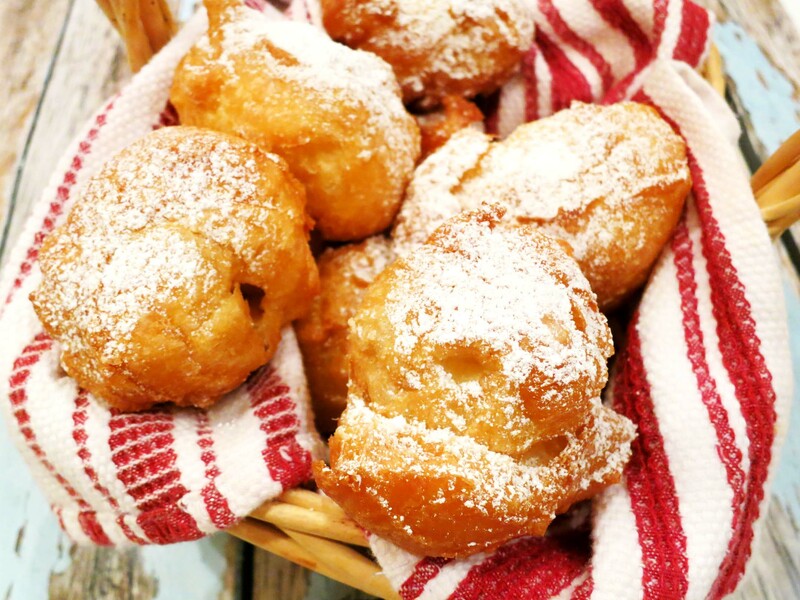 This recipe is a pate choux beignet- a French version of the ‘puffed’ pastry. The yeast version of beignet is more of an American twist- if my culinary history is correct. I seriously doubt that Ma Ingalls would be familiar with such a delicacy. As a living historian, I can say that our modern labels for food, is not necessarily the same as our ancestors. Mrs. Ingalls may have called them ‘cakes’ to impart a holiday food, instead of the common place name. Oh, and if your fried foods are too greasy the next day, your grease wasn’t hot enough, try peanut oil to fry with, since it has a higher flash point. Hmm, I hadn’t thought about the oil not being hot enough– I’ll keep that in mind at some point! 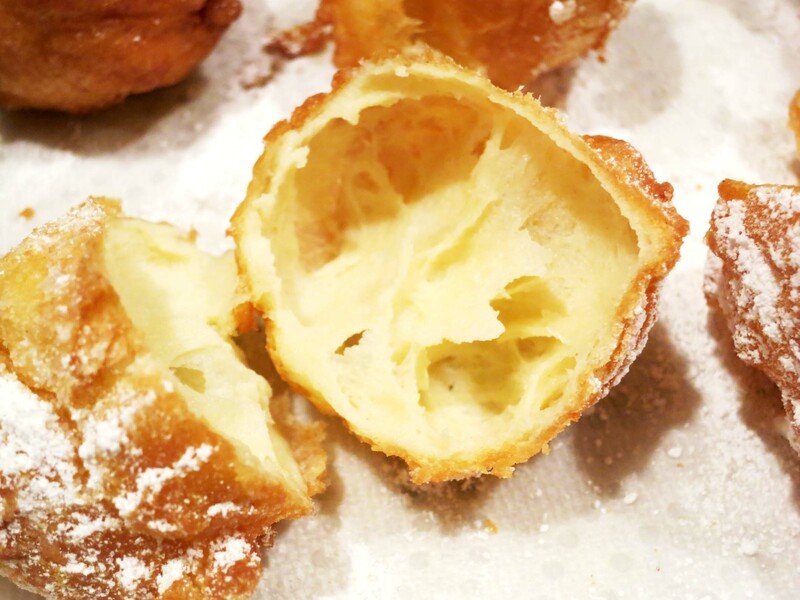 As for the sopapilla idea, I definitely think that fried dough would have more of the texture I was picturing from the quoted text– however, I have yet to find a recipe that involves eggs as stated in the book, so it’s back to the drawing board!